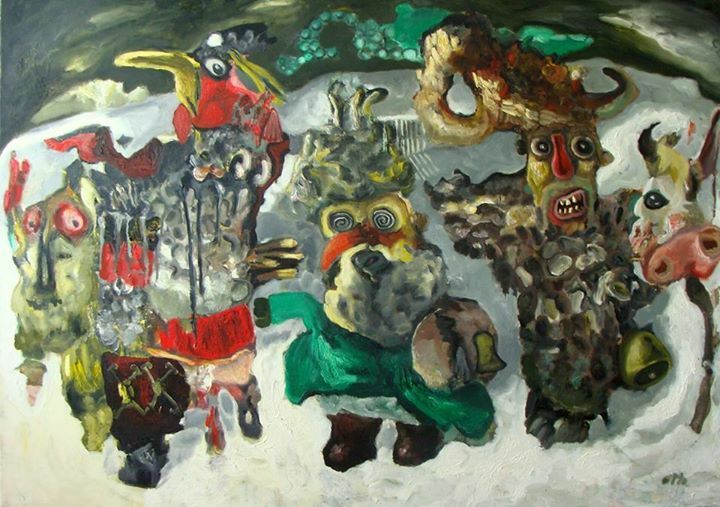 His art reminds us the the most important episodes in our Romanian traditions and folklore: slices of ancient life transposed abruptly on canvas, in hard strokes, capturing our gaze into this rich culture of the most powerful meanings, rural traditions and pagan rituals. He is 25 year old Otto. An artist who likes stuffed cabbage (sarmale ftw! ), Romanian traditions and Coca Cola. Besides his collection of Coke bottles, Otto collects money and antiques. He’s not a self-thought artist, but he likes to paint freely. Says he’s trying to overcome himself every day and this shows naturally – Otto’s so open mindend to artistic challenges that all this courage is sketched into his works of art. And wish he become the best painter in the world. That kind of painter who gives texture and colorful meanings to stories, especially Romanian ones, which passes through his filter of sensitivities and which resides beyond the apparent simplicity of his paintings. Ah, and he cannot wait to paint the Flying man aka “Zburatorul”. Why painting as a medium of expression? Tell us about three creatures / myths / Romanian characters that you like more than others. I like all mythological characters, but I choose “solomonarii”, ghosts “strigoii” and “Sânzienele”. “Solomonarii” are magicians from Romanian folklore. They were raised since childhood to learn from books other people did not have access to. They were endowed with superhuman powers and knew every language on earth, they could control the rain and were accompanied by dragons. Solomonarii disguise themselves as poor people and ask men for help: if they are not helping them, Solomonarii bring hail over the village. We could say these shamans were kind of Gandalfs. Some researchers say that they were the Dacian priests kapnobatai. I really like their legends because they are full of magic, but also because many of them are very relevant. Ghosts “strigoii” are evil spirits who remained on earth. On St. Andrew’s night, when it says that “skies are open”, they could go out to do harm. And besides that garlic it is said to be put at the door to banish them, a practice to stop ghosts was that the dead ones to be exhumed and to stick a stake into their heart. I do like their legends, especially since our folklore find the strongest antithesis of them and “Sânziene”. Evil versus love. Sânzienele therefore. This celebration of love, which we celebrate on June 24, is full of traditions and rituals. Sânzienele entities are best personified in beautiful women dancing “hora” (Romanian popular dance in which people hold their hands forming a circle) in nature. But they can become evil Fairies, “ielele”, if their ritual is disrespected. On midsummer, young people gather and make a fire to jump over it. This feast, close to summer solstice, signifies the power of the sun, the peak of summer that man perceive as love for nature and people. At that time the flowers sânziene bloom, which are used in many rituals. Another custom is for the girls to go naked into the woods to touch the dew on the flowers of fairies. Their feast is the triumph of light over darkness. First of all, folklore is a spring of inspiration which never runs dry. What topics would you like to explore more? I’d love to paint about themes, besides folklore, like: myths, legends, and religious themes with saints and hermits. What does Romanian folklore means to you, what’s his role in your works of art? Romanian folklore and mythology are part of our national identity, they have a very important role for that. First, folklore is a neverending source of inspiration. Second, it sends you to the beginning of all, to the primordial man and his rituals which connected us with Nature. I believe that, by painting stories of our folklore, we carry on what our ancestors began. I believe that, by painting stories of our folklore, we carry on what our ancestors began. Your favorite place where you find yourself or wherever you like being alone in. In addition to the places where I grew up, I have no other place to go alone, so, although I like them very much, I prefer old buildings in Bucharest. But I think I found myself everywhere in Romania. Are there any elements that aren’t missing from your paintings? How do you reinvent such old stories of Romanian popular culture? During this time, I paint as if everything would be in a globe. A globe that should protect the suggested atmosphere of the Romanian village, in that particular painting. Image distortion, especially in landscapes, is a reshaped reality, a different dimension where time and space change and create a magical ambient specific to our lands. Was there a specific time that guided your direction to painting? What have you learned since you began to paint and wanna share with us? In connection with the technique, I do not think they are able to give advice. But I learned it’s most important to do what you love. Even if sometimes it’s hard if you do from the heart, and get involved more clearly you’ll have more enjoyment. Personally, I do something, I want to be the best thing I’ve done.